A single Pacific oyster ready for sale on a farm in Southcentral Alaska. Aquatic Farming - culture of organisms by a variety of means to maturation. In Alaska this only includes the farming of aquatic plants and shellfish. Farming of finfish is prohibited. What is required in order to operate an aquatic farm site? Alaska law requires that any person must be permitted to engage in aquatic farming activities such as operating an aquatic farm site, to possess seedstock, to plant seed on your leased land, and to harvest market size aquatic farm product on the leased site. A person must first apply for a tideland aquatic farm lease with the Department of Natural Resources (DNR) and an aquatic farm operation permit with Alaska Department of Fish & Game (ADF&G) by using a joint-agency aquatic farm program application. A signed lease agreement is required for aquatic farms on state lands before an operation permit is issued. For more information of aquatic farm requirements in Alaska, please refer to ADF&G Aquatic Farming Permitting Requirements. How do I apply for an aquatic farm site and what does it cost? You may apply for an Aquatic Farm Operation Permit by completing a Joint-Agency Aquatic Farm Program application form and submitting it to the Department of Natural Resources. The application-processing fee of $100 is required to be submitted along with the completed joint-agency application. For aquatic farm projects proposing to use the intertidal or subtidal areas for on-bottom culture, ADF&G requires that a survey of species intended for culture be conducted, in order to determine the initial abundance at the site. The fee for a subtidal on-bottom culture aquatic farm site survey is $5,000 per site and for an intertidal on-bottom culture aquatic farm site survey is $2,000 per site. This survey fee must be submitted with application packet. For more information about how to apply and fee structure, please refer to ADF&G Aquatic Farming Permitting Requirements. An application opening period is scheduled every year from January 1 through April 30. Public notices of the application filing period are posted on line on the DNR's web site and are also published in various newspapers throughout the state. You may also ask the DNR Aquatic Farm Program Manager to place your name on the aquatic farm mailing list so you will be notified of future openings. How long will it take before I can start farming? The review process will take approximately 12 months during the regularly scheduled opening or 6 months for any over-the counter sites that are either pre-authorized sites or those in designated areas. However, if applications are incomplete or substantial environmental or local issues arise during the lease application review process, the application can take longer to complete. For this reason, we recommend that you contact the Aquatic Farm Program staff to conduct a pre-application meeting before you submit the application, in order to discuss the site location as well as other important matters pertaining to your application. 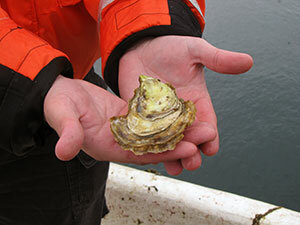 What kinds of shellfish and marine plants are being raised in Alaska? Pacific oysters (Crassostrea gigas), blue mussels (Mytilus trossolus), littleneck clams (Leukoma staminea), geoduck (Panopea generosa), scallops (Chlamys rubida, Chlamys hastata, Crassedoma giganteum, Patinopecten caurinus), bull kelp (Nereocystis leutkeana), and Porphyra species. Where do I get seed? Hatcheries spawn adult oysters and produce microscopic oyster spat. Nurseries grow these spat to a large enough size for shellfish farmers to place in aquatic farm gear. In the state of Alaska, seed sources must be certified disease free. Seed of indigenous species to be cultured at an aquatic farm site must come from within the State. As of 2010, there is one hatchery and three nurseries in Alaska. There are also seed sources outside of Alaska that are certified to ship Pacific oyster seed to permitted aquatic farms in the state. For more information on seed sources, refer to the annual listing of certified seed sources (PDF 162 kB). For more information on the certification requirements of hatcheries and nurseries, refer to the Regional Information Report 5J14-04, Policies and Guidelines for Alaska Fish and Shellfish Health and Disease Control (PDF 614 kB), by Dr. Ted Meyers. October 2014. 55 pp. What are my requirements as a farmer? Every aquatic farmer must file an annual report to fulfill the requirements of both Departments of Natural Resources (DNR) and Fish and Game. The annual report is used to monitor the development and production of your aquatic farm site as authorized by both agencies and to ensure that you are meeting all requirements. In order to maintain your tidal or subtidal land lease with the Department of Natural Resources, you must meet the commercial use requirement of the lease. The commercial use requirement is dependent on the acreage of the lease. More information can be found at the DNR website. Depending on culture type, aquatic farms may have other reporting requirements. Please refer to the aquatic farming reporting requirements section of our website for more information. Please refer to the Aquatic Farm Requirements page for a listing of all agencies that oversee the aquatic farm industry in Alaska. or contact us.